This little thing is all painted up, and I'm quite happy about the way the colors came together. 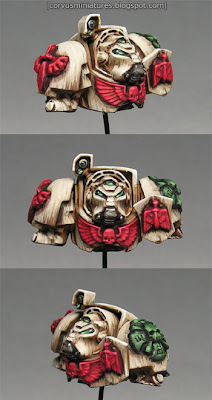 As you might have read in the first post about this bust, it's actually a test figure for a unit of Deathwing Terminators. The unit is already fully assembled, primed and basecoated. So expect more Deathwing real soon. 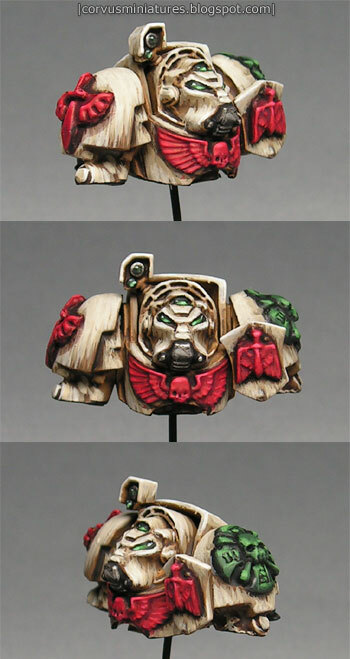 Well judging by this bust your Deathwing squad for the Golden Bolters will be something quite special. Look forward to seeing them as you progress with them! Need to start my entry soon! I actually really like the bust idea though, it looks quite cool, I reckon I could convince myself to have a shelf of 25mm busts... not sure I could convince my partner on the merits of that shelf though!